In March 2019, SE University welcomed Geoff Blumber and Ravi Ozarker, PE, P.Eng., from Hexagon PPM, to present Avoiding Vibration Issues in Your Structure. Geoff designated the James Mirabal, P.E. Endowed Scholarship in Civil, Architectural and Environmental Engineering at the University of Texas at Austin (https://endowments.giving.utexas.edu/james-mirabal-p-e-endowed-scholarship-in-civil-architectural-and-environmental-engineering/) for the SEU Speaker Inspires donation of the month. 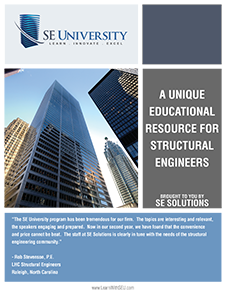 Thank you, Geoff, for helping structural engineers with your SE University session, and for your designation of the the James Mirabal, P.E. Endowed Scholarship in Civil, Architectural and Environmental Engineering at the University of Texas at Austin as our SEU Speaker Inspires Organization of the Month!